Rotary International Immediate Past President Ian Riseley visited our Rotary Point tree planting at Richard's Beach. Well done to our RYE student Eugenio who walked the track with the 9970 and 9980 students and thanks to our club members Craig, Denis & Richard who accompanied them. 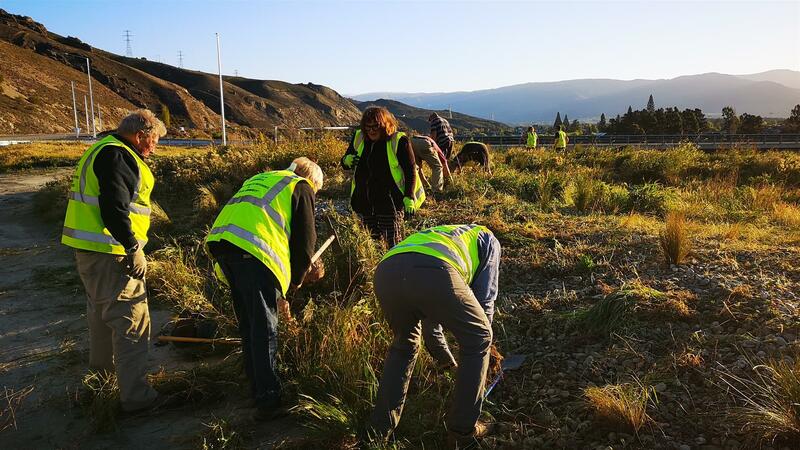 Monday night saw a team from Cromwell Rotary and some enthusiastic community members turn out to clear dead plants and unwanted growth from both sides of the access road to Cromwell at the eastern end of the Deadman's Point bridge. Tussocks now have more than a fighting chance of survival. Do stop off and have a look at the clearance next time you are passing. 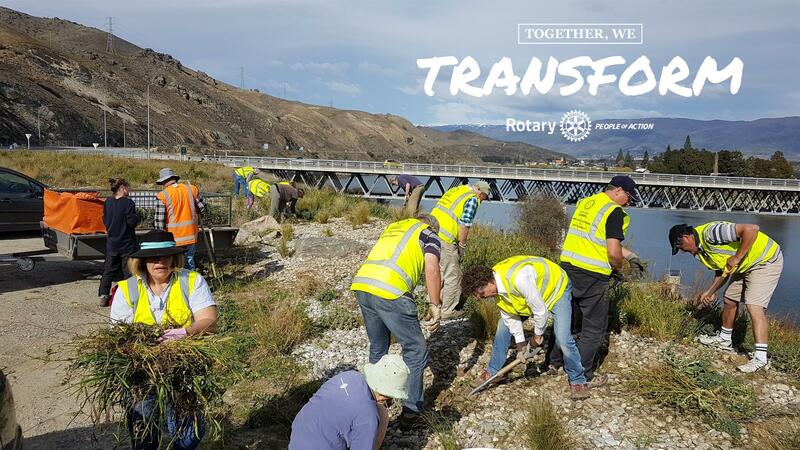 Rotary says a huge THANK YOU to the members of the community who came along to help - and also acknowledges the lovely toots received from many of the motorists and truckies as they drove past during the clean-up. 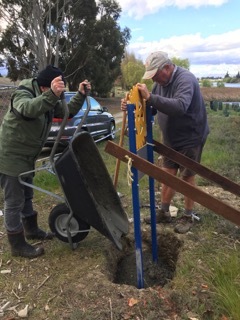 Rotarians and locals get to work at the bridge entrance to Cromwell. including Rotary exchange student Eugenio Monasterio, (white t-shirt) newly arrived from Chile, and studying at Cromwell College this year. Check out this great video from Allan Derrick of our 4WD trip in January. A great day had by all. 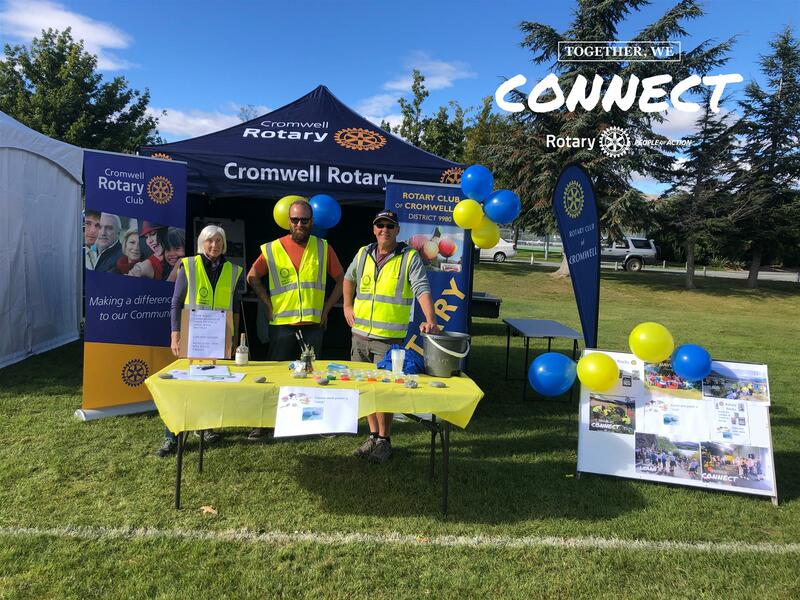 Thanks to Cromwell Rotary and the Otago Motor Trust Club the children attending Cromwell's primary schools, preschools and kindergartens are now more clearly visible when they are out and about around the town. 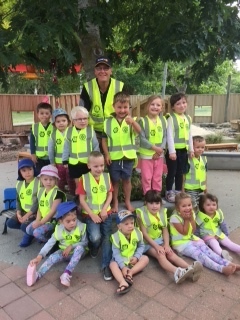 Pictured here is Rotary President Craig Lunn in the playground at Kids First Kindergarten surrounded by some of the children sporting their new fluoro jackets. 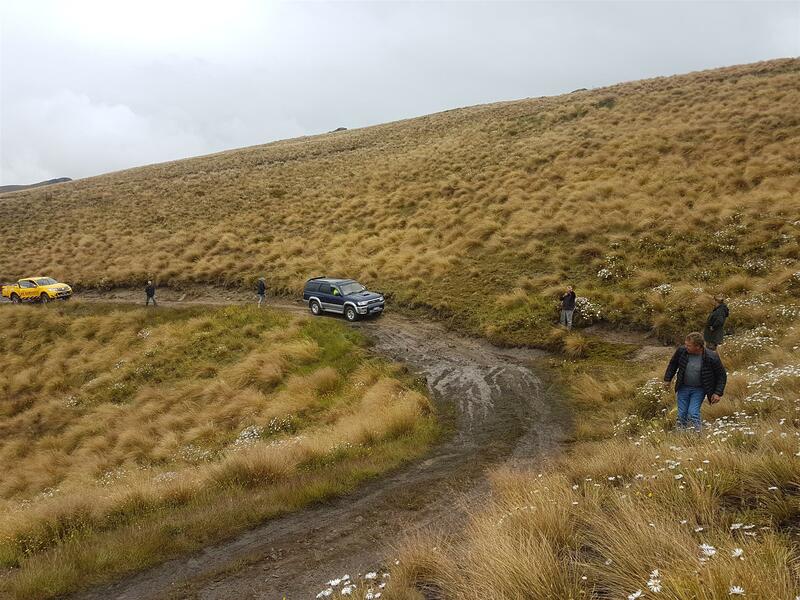 Forty one vehicles enjoyed this years Heartland Safari which traversed from the starting point at Forest Range station and concluding at the Old Stockman’s hut in the Lindis Pass. Russell and Jeanette Emerson lead the tour and provided some local knowledge along the way. The participants gained over 1100m in elevation starting at 466m above sea level. This was the first time in the events history that it had to be postponed due to the wet weather the previous Sunday. As we set off from Forest Range station the weather looked a little unsettled as we traversed the Grand View Ridge. Lunch was enjoyed at West peak, however by the time the last ten drivers had negotiated a small mud hole the cloud had descended limiting the view. 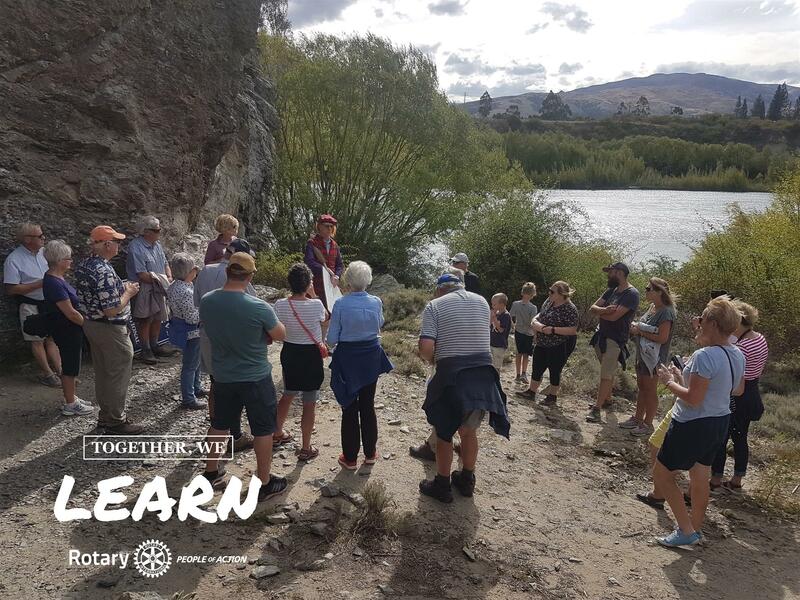 After lunch we continued on and with the weather clearing we had fantastic views from Breast peak and into the Lindis Creek which we crossed before completing the day back at the Forest Range Woolshed where Nick and his crew had a cool beverage and sausage on offer. Another fantastic Safari thanks to the efforts of Bill, Ross and their team. These events wouldn’t be possible without the generous support from the landowners and Russell and Jeanette did a fantastic job leading us through the their and neighbouring properties. Hundreds of donated books have now been re-housed to eager new readers following the Rotary summer book-sale over the weekend. 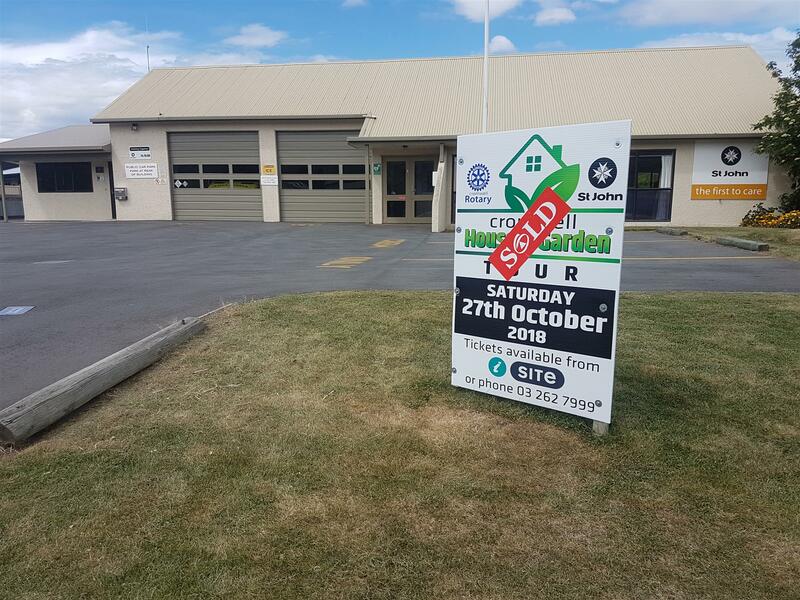 Held over 2 days at the spacious Cromwell Bowling Club stadium in Alpha street, the sale netted a little over $5000 with an average price of $2 per book. Pam Broadhead, one of the organising group reports that about 100 banana boxes full of books were sold. 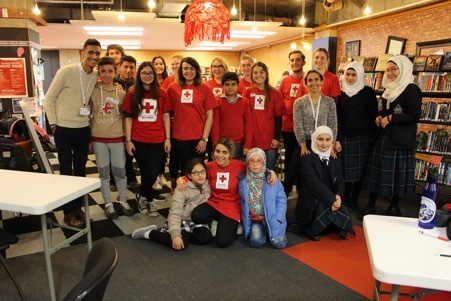 "We are very grateful to the locals and visitors alike who came to browse and buy - and of course to the many who gave us the books to sell in the first place. We're now going to have a little rest and then get stuck in to the mammoth task of sorting the hundreds of new donations that have been received recently for the June book-sale. That's the super-size sale. The Bowling Club stadium will be groaning to cope with all the books (and CDs and LPs and magazines, and puzzles) we've got ready for the winter book-sale the first weekend in June." Anyone with books, CDs, LPs, magazines to donate can drop them in at the Rotary book exchange container in the forecourt of Freeway Orchard. It's open 363 days a year during business hours. 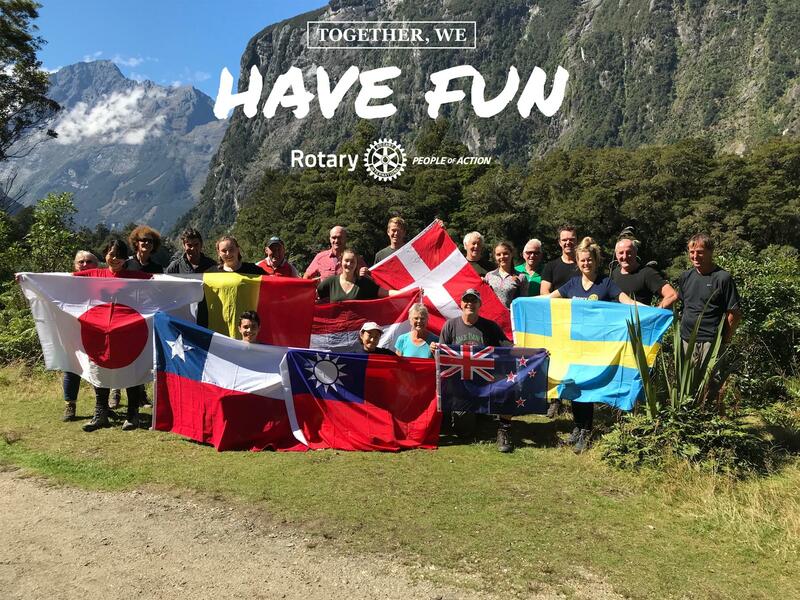 Rotary also acknowledges the generous support of sponsors and supporters : Continental Party Hire, R & R Hiabs, Nichol's Garden Centre, and the Cromwell Bowling Club. 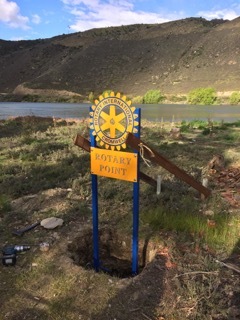 Some of our Rotary members have been working hard to upgrade the Lowburn end of the 45th Parallel track. Many locals & visitors that take the opportunity for a bit of a blow out... the view at the top makes it all worth while! 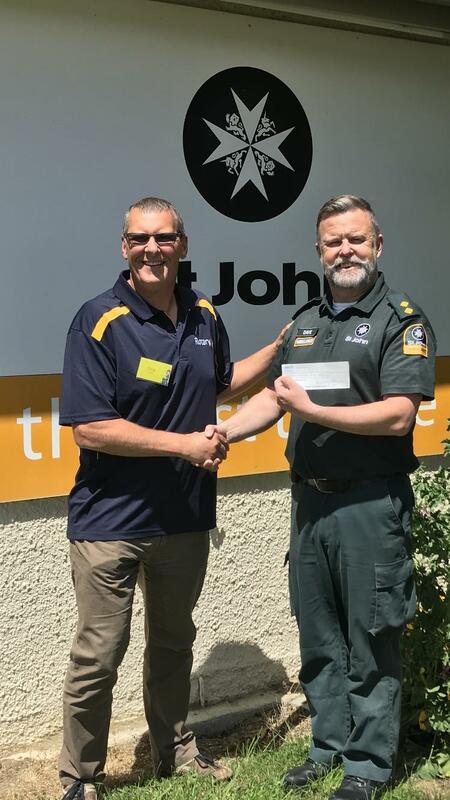 Rotary President Craig Lunn took huge pleasure this week in presenting Dave Anderson, St John Manager, with a cheque for $15000 towards the St John rebuilding project in Cromwell. 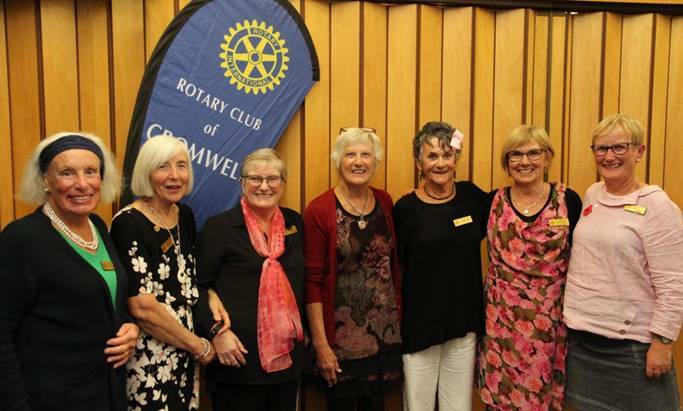 $13,500 came from the recent Rotary organised House and Garden tour, and Rotarians decided to top it up to $15000 with funds they've raised from other recent projects. Both Craig and Dave once again thanked all participants in, and sponsors of, the tour, as well as the most important people of all, the 12 home-owners who made it all possible. 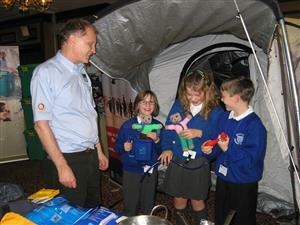 Cromwell Rotarians joined in the social activities at the town's new Lifestyle Village. With over 70 people now living at Golden View, we rocked up with food and BBQ skills to join them in a few ends of bowls, lots of chat and the occasional wine and beer of course. It was a gloriously sunny evening so lots of laughter and general enjoyment ensued. And who won the bowls ?? Well let's just say there was a range of skills on display !! Postponed to 13th January due to bad weather. 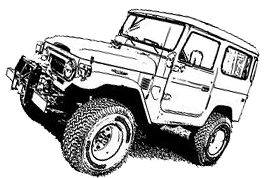 $100 per vehicle - limited to first 40 vehicles to register. Sorry - but this event is now fully subscribed. 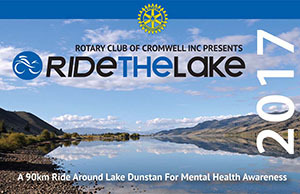 In association with Shimano NZ Ltd, Central Otago Hunting & Fishing and the Rotary Club of Cromwell. 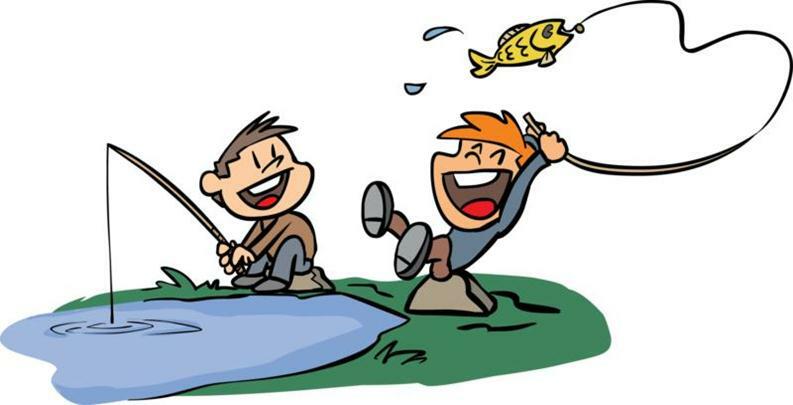 This is a serious fishing competition with a family flavour. Weigh-in: Starts at 2pm at the Lowburn Hall, Lowburn Inlet, Lake Dunstan. 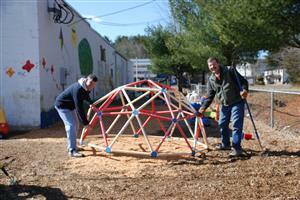 Net proceeds from this event will be used for local Community Projects. The sun shone on the 250+ visitors who participated in the weekend's house and garden tour of Cromwell and surrounding areas. In a well orchestrated tour, participants were given maps which directed them around the 12 homes in a steady stream meaning that crowds did not build up in one place and people had plenty of time to wander round each home and garden. Leader of the organising team Rotarian Paula Jackson was delighted with the success of the day. 'We could not have done it without the huge generosity of the 12 home-owners and the willingness they showed to open their homes to the passing parade of interested ticket-holders. It means that all the ticket money will be going to St John for their new building." 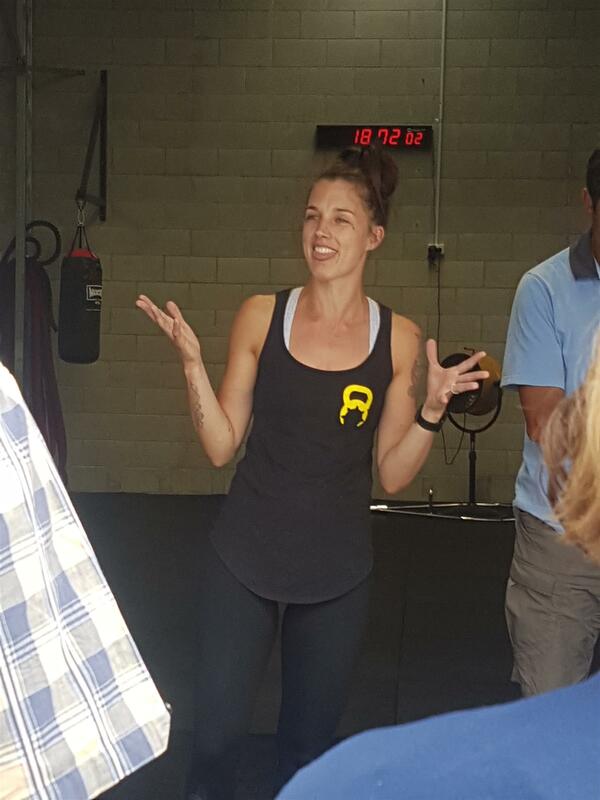 She estimates that the proceeds will be in the vicinity of $13,000 and sincerely acknowledges the home owners as well as all the local businesses who sponsored all other elements of the tour. Sponsors of the event were Harcourts, Feldwick Insurance, NZ House Surveys, Begg Security, Aitken Joinery, Golden View Lifestyle Village, Guthrie Bowron, Trends Kitchen, John Wekking Electrical, Shoes Unlimited, Metro Graphix, Nichols Garden Centre. Many many thanks to you all. Apologies on the website are only necessary for the nights when we are dining at the T&C club. 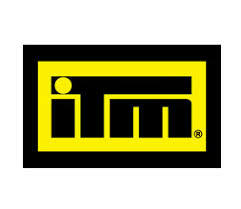 On the other Monday nights, when we plan activites or visits, you will be sent an email about each event. You need to SIGN UP for these events by following the instructions in the email. 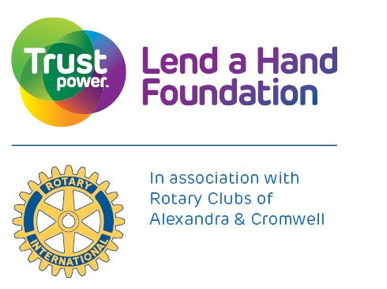 Saturday October 27 will see a host of Cromwell homes and gardens open to the public in an event organised by Cromwell Rotary in support of Cromwell St John. The selection of homes generously opened up to visitors by their owners include new homes, older homes, apartments, and beautifully restored villas and of course the visits include an opportunity to see their respective gardens as well. The tour starts at 10am on the day and continues until 4pm . Your own transport will be required. 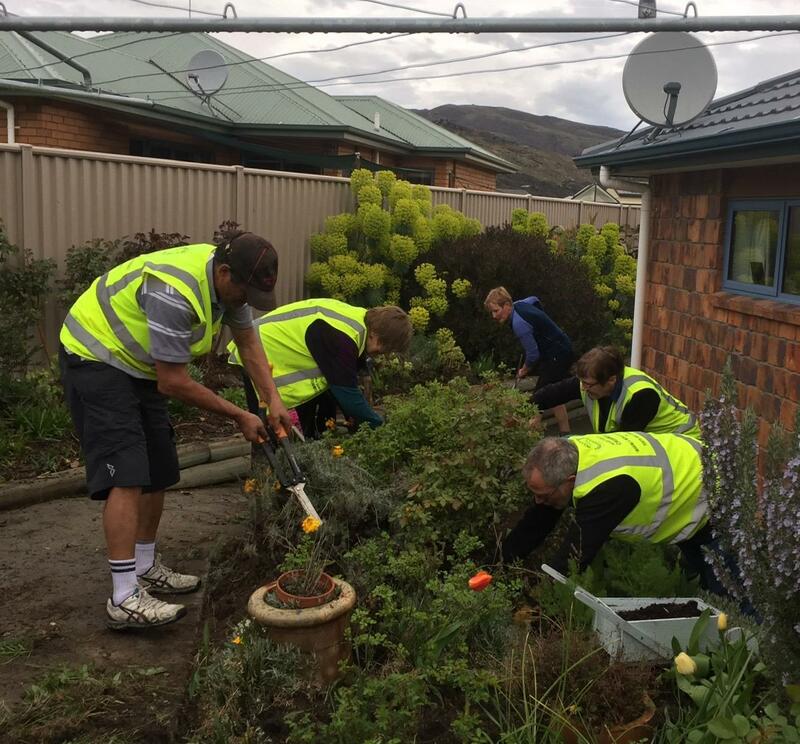 St John in Cromwell needs a new home and because the organisation relies on fundraising to build all its new buildings, Rotary has been approached to help. A small group of Rotarians have developed the House and Garden tour as a way to profile a selection of interesting and unique homes in our area. Visitors on the day to the selection of addresses will, through their ticket purchase, be making a significant contribution to this exciting St John project. St John has identified the need for a new and innovative ambulance hub to help future proof its operations in this area given the rapid growth in both permanent and temporary population. 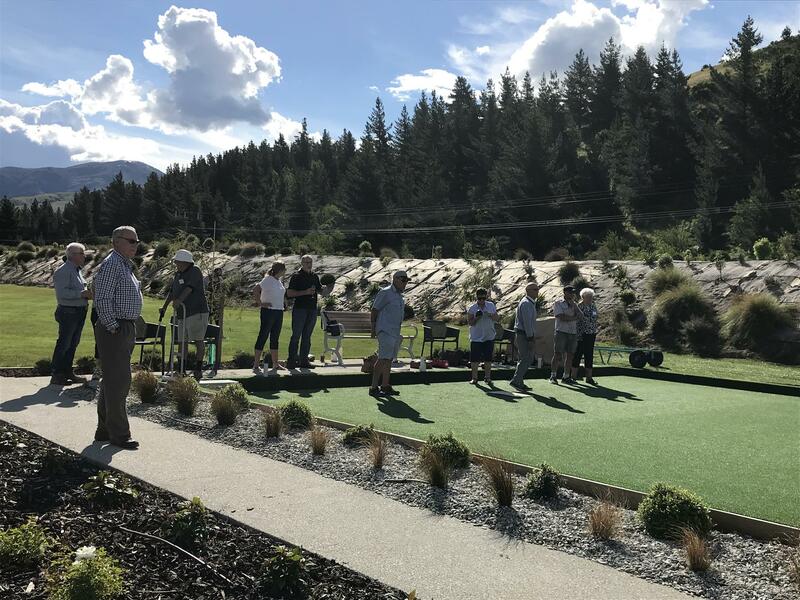 As we are all well aware, Cromwell and surrounding Central Otago areas are becoming a very popular destination - and of course both domestic and international tourism is increasing rapidly as well. In this increased growth, St John reports that demand for emergency services is up almost 5% per annum and planning is well underway for managing that likely continuing trend. They are looking to the 'hub and spoke' model developed in Christchurch after the 2011 earthquake as the likely solution. The planned new ambulance station will be built to withstand a magnitude 8 earthquake, and could be easily converted to a post event response location, acting as a community meeting space. The proposed design reflects the unique character of the Cromwell region, using materials and vegetation that will evoke both the natural and cultural landscape of the area. Because the value of having a strong St John in our community is so universally supported, lots of wonderful sponsors are supporting Rotary in this venture. They include Harcourts, Metro Graphix and Design, NZ House Surveys, Guthrie Bowron, Nichol's Garden Centre, Shoes Unlimited, John Wekking Electrical, Begg Security, Trends Kitchen, Golden View Lifestyle Village and Aitken Joinery. 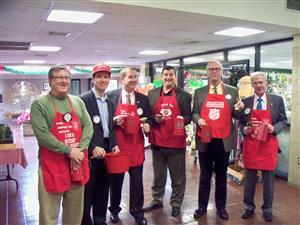 They are helping ensure that funds received through ticket sales can go straight to St John. PLEASE NOTE : Because of the nature of the terrain at some houses, there is no wheelchair access, nor are the visits in general, toddler or young child friendly. There are 2 ways to get tickets for the House and Garden Tour tour. You can phone 03 262 7999, or you can call in to any Central Otago I-SITE Centre (Cromwell, Alexandra, Ranfurly and Roxburgh)to collect a ticket. Ticket price is $45 per person. Any queries about the tour to Paula Jackson on 0275 725 457. It was great to be part of an awesome community event with the Lakeside clean up. Deadman's bridge was our area of focus this year. Thanks to Cromwell Rotary members & friends who helped, along with Mokihi Trust members. The senior debating finals teams are pictured here with Shirley Howard who presented the Bob Howard Memorial Trophy for the 36th year to this year’s winning team Mount Aspiring College. The topic for this year’s debate was - That the glass is half full. Pictured L to R: Jake Nicholson, Joe Strawson, Isobel Smith (Mt Aspiring College Team), Shirley Howard, Bethany Johnstone (rear), Tamara Hansen (front), Myah Scott (Cromwell College Team). Lucy Laws proudly holds the John Webb Memorial debating trophy which she and her co-debaters Joshua Hancock and Jemima McCombe-Rae won in the final of the Central Lakes Schools Junior Debating Championship for 2018 at our meeting on August 20. The topic for the debate was "That we need more heroes". Ainslie Webb was on hand to award her trophy. She commented in her presentation speech that her husband and our good mate John W would debate both formally and informally. It was her comment about the informal debating that got the biggest cheer from the gathered throng. Daffodil Day is here again. 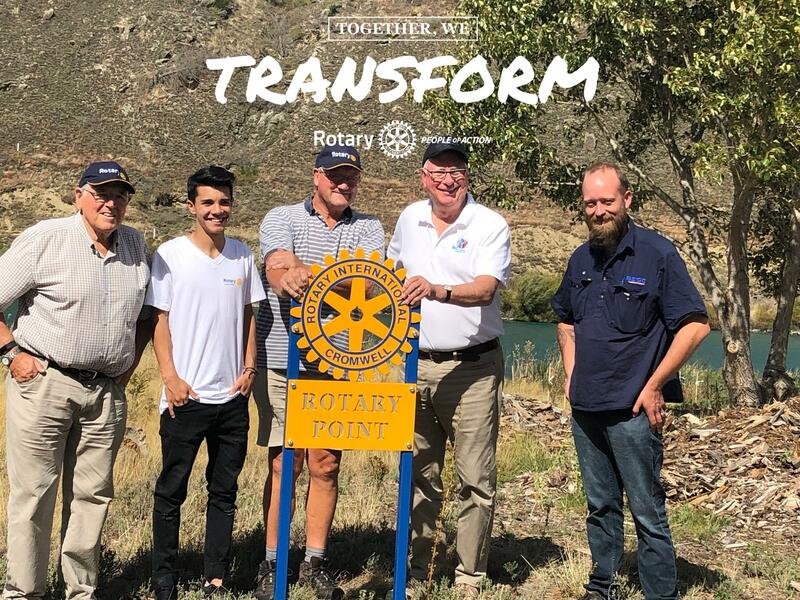 The following article appeared on the Rotary Down Under Facebook page! 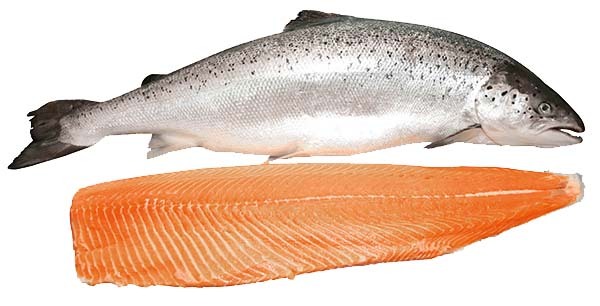 The Rotary Club of Cromwell is once again selling fresh salmon in time for your Christmas celebrations. between 3 & 5pm at 87 Inniscort Street, Cromwell. All orders must be in by Friday 8th December. Please click on the ORDER HERE link below to enter your order. Smoked Salmon @ $30 per 500 grams. Payment is required on pickup and is by cash (preferably) or cheque only. Sorry no EFTPOS or Credit Cards will be available. Forty-five riders enjoyed perfect conditions for a memorable ride around Lake Dunstan. All proceeds from the ride will be donated to local metal health initiatives. Click Here to see a tentative list of the riders' times.